calling out anti-semitism in all forms. his remarks are 25 minutes. now to start like to talk little bit about my family. i've known so many of you for so long you are like family to me. this year has been filled with several -- for the union -- schumer family. my daughter allison and her partner have set a wedding date. just a few weeks later my older daughter jessica told us she was pregnant with our first grandchild. the due date november 18. we pray that the baby would be early or late. prayerslistened to our because a very pregnant jessica joined our family for a beautiful wedding in brooklyn and a few days later no one melvyn schumer schapiro was born. he turned for yesterday. he smiles. national interest. but i fear too many of our younger generation don't have the same understanding of the threats facing israel as my generation did. they don't know that as long as israel has exist to she has had to defend herself from enemies seek to wipe her off the map. that's a fundamental problem we must confront head-on. 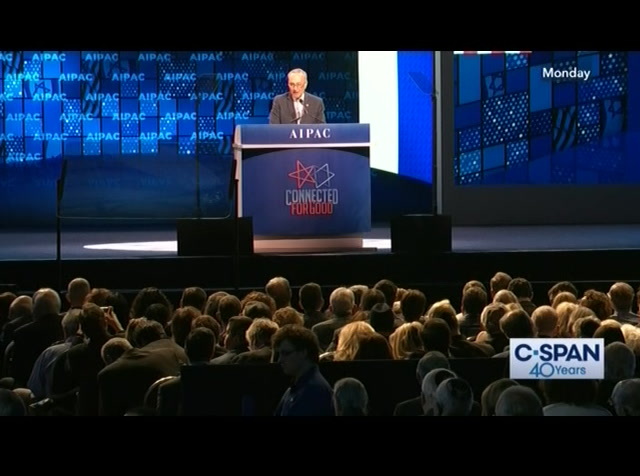 that is certainly not true here at aipac. our young people know the importance and the story of israel and i know there are several thousand students here tonight. stand up. let us applaud you for being here and helping the cause of israel. we need you and love you. but we know that this problem of ignorance about israel's difficult history still persist at two large a scale. particularly among young. so it's incumbent on us to explain that history to every single member of the younger generation jew and non-jew alike. we must remind them and teach them the threats to israel are not just in the past but very much in the present and the future. noahi think of my grandson who was born at a time when israel is stronger than ever i think about what i will tell him when he's old enough to understand. noah that as a young man at james madison high school i remember walking to class with a transistor radio to my ear. course i will have to explain to him what a transistor radio is. listening to the news reports that june about the six-day war. for responding with no government can allow civilians to rocketected attacks time and again and i stand shoulder to shoulder with the people of israel condemning those attacks and doing what they must to defend their homeland. 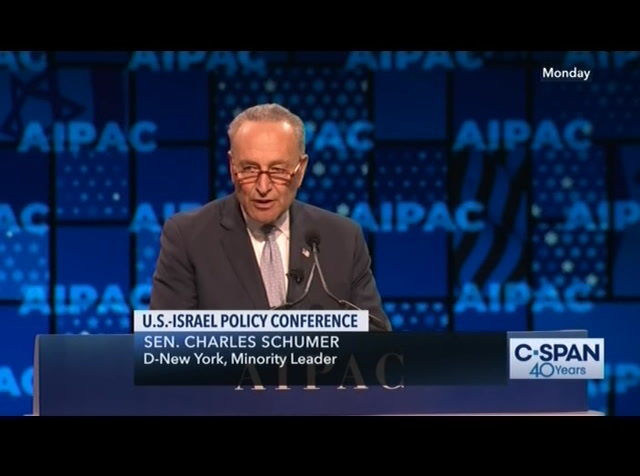 targetingese enemies israel's door believe that a jewish state in any form should exist. we must never forget that. 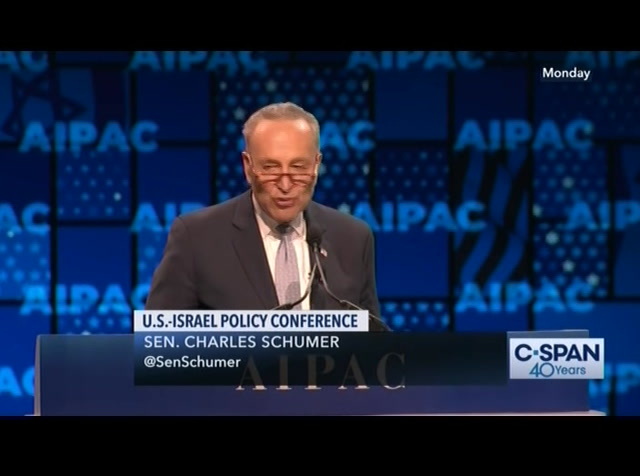 thisy friends, to do all we must keep the u.s. israel relationship with partisan. we can only hope to defend partiesboth side-by-side. so long as we maintain a united front. democrats and republicans together. this has been a mission for me. from poisoning the bipartisan support that israel has always enjoyed. my friends, we also must continue to stand firm against the bds movement. i have long opposed the bds movement publicly, privately and continuously. toouse its founders and many of its supporters do not believe the jewish people have a right to any state in their homeland. whatever its size and boundaries. we must be clear eyed about the history of this bds movement. i ask anybody who supports bds or is considering supporting it particularly young who may be of good will to remember the following and we must make sure they know it. to the days when major companies boycott israel as they did in the 50's and 60's. and more than 30 years would pass because the arab league boycott is broken by egypt and still today there are nations that actively enforce a primary boycott of israel. 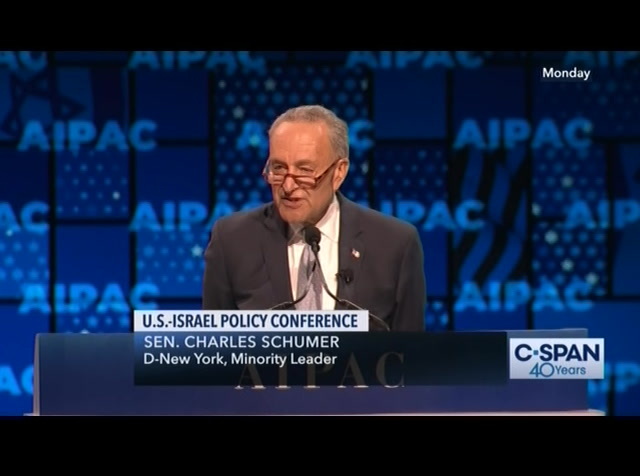 bds must be understood first and foremost is the next chapter of this troubled past. make no mistake about it. 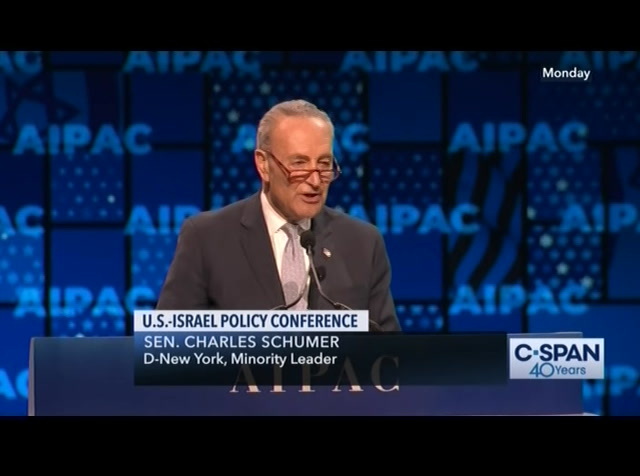 founders did not believe in any state of israel and too many of its leading proponents want nothing more than for israel to disappear. further than the words of the movement's founder who statee opposed the jewish in any part of palestine. american city of saying jews will not destroy us. we have a solemn obligation not to hold their tongues were arson are language but call it out with courage and clarity. 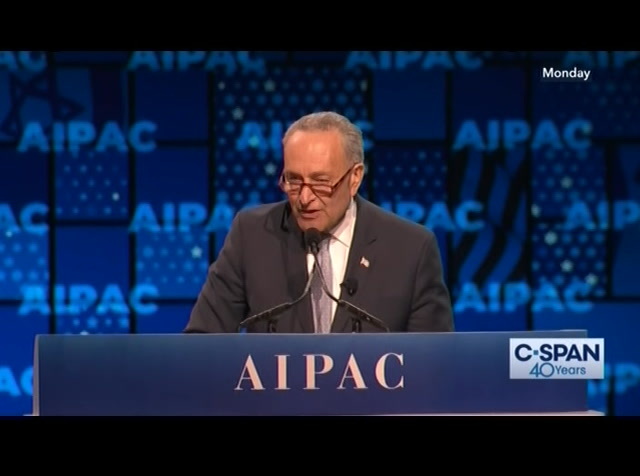 onlysomeone names prominent jews is trying to buy or steal our elections we must call it out and when someone says that being jewish and supporting israel means you are not loyal to america we must call it out. when someone looks at a neo-nazi rally and some very fine people among its company we must call it out. 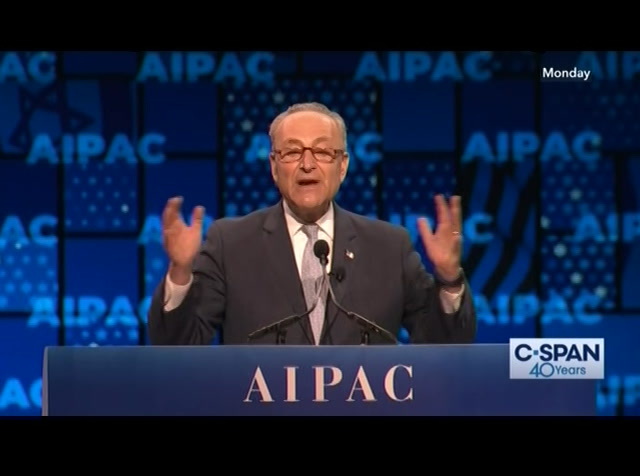 when someone suggests that money drives support for israel we must call it out. 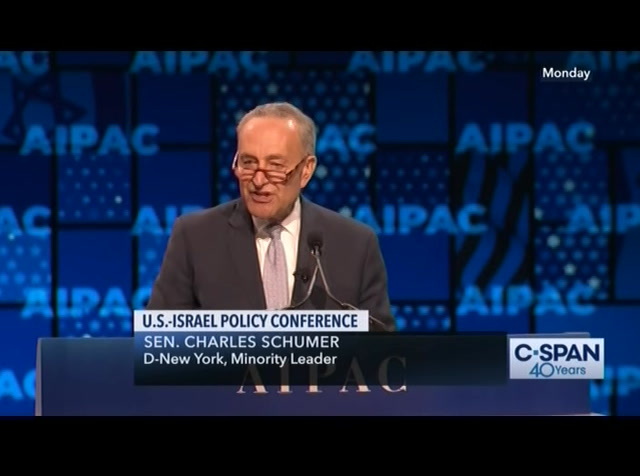 we are here because we support the only jewish state in the world and because it's in america's interest to support israel. found sanctuary on these wonderful shores where because of the tolerance and openness and opportunity that courses through all american life their grandson could stand before you as the highest elected jewish official ever in america. and i know you join me. we all cannot help but think we are the lucky ones. i know i'm not alone in bearing the weight of these generations in the painful history of our people. stories of us has the and it is because we carry with us the history. 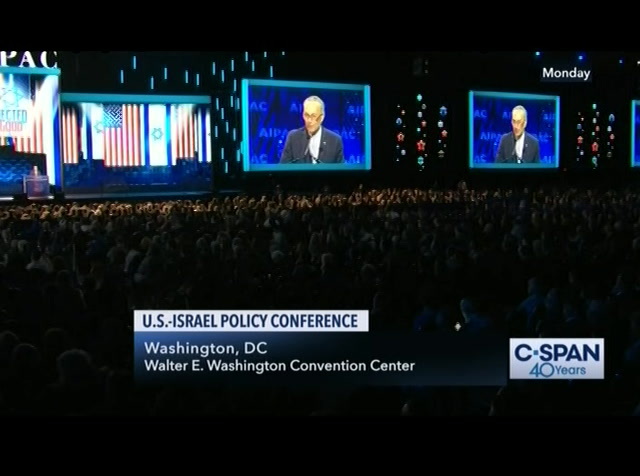 we feel so deeply about the cause of israel and the friendship between the united states and israel. is because of this history that i want israel to be always there, always prosperous, always strong, always free. 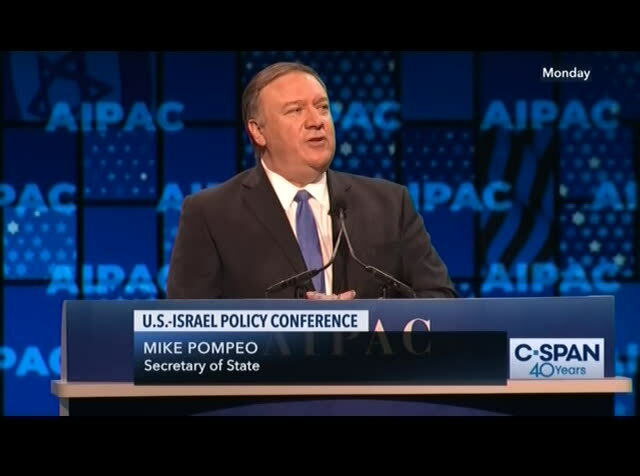 my friends, we must never forget what israel and her freedom means to the jewish people and what the friendship of the united states means to securing that freedom. i will not forget. i know you will not forget and we fight to protect jewish people here in america and in the state of israel. in america and in israel. the people israel lives. thank you. god bless you. 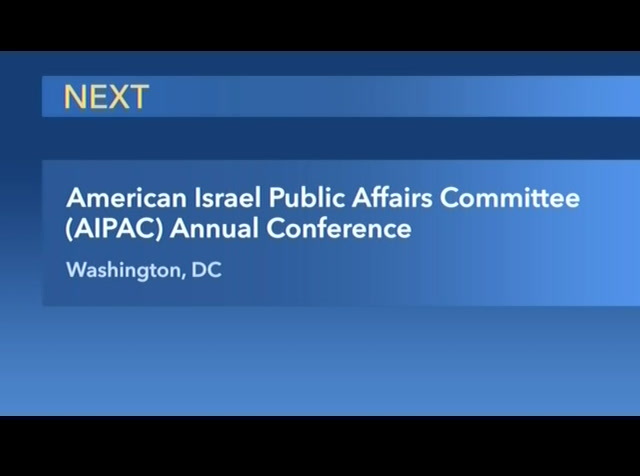 aipac, keep up the great work. 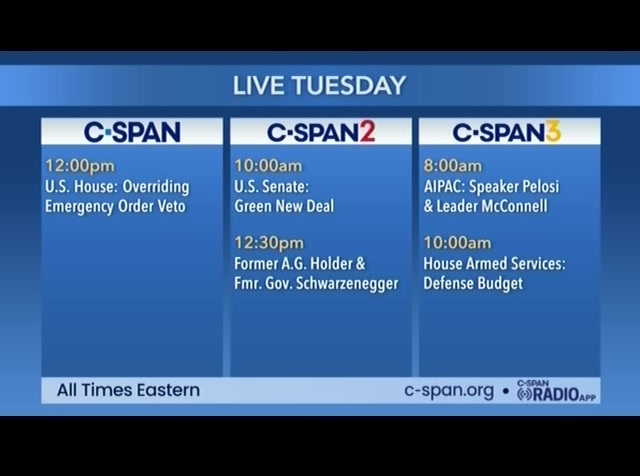 >> coming up to stay on the c-span networks, the house takes up a vote on overriding the of thent veto legislation blocking his emergency declaration for a wall at the u.s. southern border. Senate Minority Leader Chuck Schumer (D-NY) addressed attendees at the American Israel Public Affairs Committee (AIPAC) annual conference in Washington, DC. During his remarks, he emphasized the Democratic Party's support of Israel and talked about "calling out" anti-Semitism in all its forms, saying, "If you only care about anti-Semitism coming from your political opponents, you are not fully committed to fighting anti-Semitism."